The most common symptoms, headaches and neck pain, can occur weeks or months after a whiplash injury. Whiplash sounds nasty because, well, it is. Coined from its resemblance to the action of a whip, whiplash, or Cervical Acceleration/Deceleration Syndrome (CADS), occurs when the head is forced in one direction with a sudden movement, whether it’s from an automobile accident, physical abuse, or a contact sport. It may not feel like much right away, but symptoms can sometimes take years to develop. When it occurs, muscles, tendons, and ligaments are forced past their breaking points and tear and get damaged. Then they stiffen to support the neck to keep from further damage to the spinal cord. Many common symptoms of whiplash include neck pain and stiffness, headaches (usually at base of skull), dizziness, blurred vision, and fatigue. Some people, usually those with weaker necks (such as children, smaller women, and the elderly) and/or with more forceful incidents of whiplash, report difficulty concentrating, ringing in the ears (tinnitus), memory problems, irritability and sleep problems. People are told to see their doctor if they experience pain that spreads through their shoulders and arms, if it becomes too painful to move your head, or if you experience numbness or tingling in your arms, but we think that before you have any symptoms at all you should go right to your chiropractor. Doctors of chiropractic are specialists in the musculoskeletal (muscles and bones) system of the body and are trained for years in how the muscles and bones interact and affect each other. No other health care professionals have the same combination of education and training, and this makes them uniquely qualified to work with whiplash injuries. Today the single largest contributor to spine and neck pain is motor vehicle accidents, totaling 6 million cases per year. 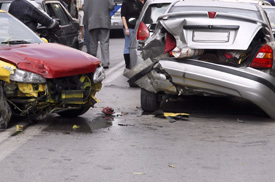 Of those, about half will be whiplash type injuries, and of those, 500,000 to 900,000 will develop chronic symptoms. Despite patient satisfaction with chiropractic care, it continues to be downplayed and questioned, even denied in some cases. This is often due to the legal system, and the tendencies of some insurance companies to put money before the health of their customers. It gets caught up in the legal system because there are still some “medical experts” that say that it “doesn’t exist” or that it is a “self healing injury” and doesn’t need to be paid for. These “experts” don’t think that whipping the head back and forth does any damage. There are two studies out right now that look specifically at people who went to medical doctors for chronic whiplash, didn’t get any better, and then went to a chiropractor. Both studies results were amazing, and one concluded that “chiropractic is the only proven effective treatment for chronic cases [of whiplash].” What’s even better is that the co-authors are Drs. Gargan and Bannister, English medical physicians who are the two most published people on chronic whiplash pain. Shop for a Safer Car – many car companies are recognizing whiplash from accidents and are addressing it. Most are modifying their seats and headrests so that the whiplash motion is minimized. Also, consider mass of the car and “crashworthiness.” Smaller cars put you at greater risk. Some car companies are developing technology that senses speed and distance of the cars around you, and can warn both drivers – of the car that will be hit, and the car doing the hitting – of the impending accident, although this technology is still being tested. Keep Head Restraints in “Up” Position – 80% of cars have the head restraint in the “down” position. Research shows that having no head restraint is actually safer than having it in the “down” position. Being taller or shorter can also put you at a disadvantage, because seats are designed for the driver of average height. Seek Treatment Immediately – No matter how slow of speed your accident was, the sooner you get in to your chiropractor to be evaluated the less chance you have of developing chronic pain. Often the slowest impacts can have the worst outcomes, especially if people assume nothing was injured and so delay getting evaluated. No Damage to Your Car Does Not Mean No Damage To You! – Sometimes, when there is no damage to your car there is actually more damage to you, because your car didn’t absorb any of the energy from the crash. Listen to Your Doctor of Chiropractic - He or she is trained in treating musculoskeletal injuries, so they will have the best advice to maximize healing potential and minimize healing time so you don’t develop chronic pain down the road. Think Ergonomically - If you are injured, make things easier on yourself by limiting the movement of your head and neck during everyday activities. Simple things like sitting in a chair with armrests can help a lot, because if your arms are supported by the chair, they won’t have to be held up by your shoulder muscles that may have been damaged in the accident. Whiplash is as nasty as it sounds… and just as dangerous to your nervous system. It can give you symptoms right away, or lie dormant for years. Either way, if you’ve had any sudden movements of your head (i.e. – car accident, sports injury, etc) you should make an appointment to see your chiropractor and tell him exactly what happened and how it happened, so he or she can decide on the best way to treat you, and to help you avoid the serious results that can show up later down the road. Contact us to see how we can help you or someone you know!